There's still a lot of growth ahead for Wynn Resorts. Wynn Resorts, Limited (NASDAQ:WYNN) stock been one of the hottest in gaming, nearly doubling in the last three years and outperforming most of its major gaming rivals. The company has benefited from growing revenue in Macau, the completion of Wynn Palace in the Cotai region of Macau, and anticipation of the company's newest market, Boston, where Encore Boston Harbor is under construction. What hasn't stopped Wynn Resorts stock is the loss of Steve Wynn himself. The company's founder resigned amid sexual misconduct allegations and has sold all of his shares to prevent potential headaches for the company. That's allowed a new management team, led by CEO Matt Maddox, to refocus Wynn Resorts on profitability and growth. Here's why I think that focus will drive the stock higher in the long term. One of the ways we judge performance of gaming companies and the value of their stock is by looking at earnings before interest, taxes, depreciation, and amortization (EBITDA), which is a proxy for the cash flow coming from a resort. This is a good metric because it pulls out non-cash costs like depreciation, which are big expenses for the multibillion-dollar resorts that Wynn Resorts owns. EBITDA for Wynn Resorts is been growing rapidly because of the addition of Wynn Palace in Macau. In the first quarter of 2018, EBITDA was up 32% to $564.3 million, driven by Wynn Palace's growth. To try to get an idea of Wynn Resorts' value for investors, a ratio like enterprise value (net debt plus market cap) to EBITDA is valuable because it's more representative of value in the gaming industry than a P/E ratio, which includes non-cash costs like depreciation. I've calculated EV/EBITDA below and I've annualized Q1 2018's EBITDA because this is a better representation of ongoing EBITDA than just trailing-12-month numbers. Data source: Wynn Resorts and Google Finance. Calculations by author. 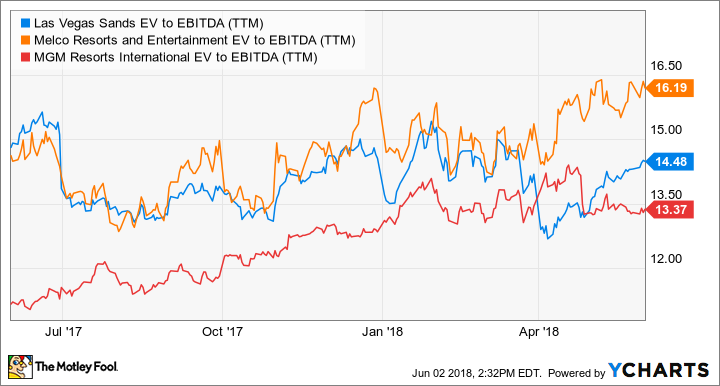 An EV/EBITDA ratio of 12.4 is on the low end of where gaming stocks are trading, and you can see that it compares favorably to Las Vegas Sands, Melco Resorts, and MGM Resorts. If investors were just buying Wynn Resorts' current business, not any growth projects, I think the current valuation would make it a good investment. But the company has a lot of growth prospects that could make it a huge winner for investors. There are three areas of growth Wynn Resorts is focusing on: Las Vegas, Boston, and Japan. In Las Vegas, Maddox has pulled back plans to build a new tower and is focusing on an entertainment and convention addition where the golf course used to sit behind Wynn Las Vegas. The investment is currently budgeted at $360 million and historically annual EBITDA for each dollar of capital invested is slightly over 10%. Expanding in Las Vegas isn't a game-changer, but it could bring some growth to Wynn Resorts. Rendering of Encore Boston Harbor at night. Image source: Wynn Resorts. Encore Boston Harbor is currently under construction with a $2.5 billion budget and will be the company's first foray outside of Las Vegas or Macau. There's no real precedent that shows what revenue or EBITDA will be in Boston, but there's a decent proxy from MGM a few hundred miles south. MGM National Harbor near Washington, D.C., was completed in 2016 at a cost of $1.4 billion and generated EBITDA at an annualized rate of $168 million in the first quarter. The annualized EBITDA return of over 12% of total construction costs proves that East Coast gaming has high potential, and Wynn Resorts hopes its new location near downtown Boston will be a bet that pays off in the long term. The wild card is Japan, which is expecting to open up a few gaming licenses in the next year or two. Estimates have put the gaming market in Japan at $10 billion to $40 billion, which could make it bigger than the $6.5 billion in gaming revenue on the Las Vegas Strip over the past year. Maddox has made Japan a high priority, and if Wynn Resorts won a gaming license there, it could be a game-changer. With shares trading at a decent value based on existing operations, these growth projects are icing on the cake for Wynn Resorts investors. One untapped option Wynn Resorts has to generate value is selling its real estate assets to a REIT. The company sold nearly half of its mall in Las Vegas to Crown Acquisitions for $292 million in 2016, but has avoided selling hotel or casino real estate thus far. To give you an idea of the value of gaming real estate, MGM Resorts sold the MGM National Harbor real estate for $1.2 billion shortly after the project was completed, so there's a lot of money that could be freed up by selling assets to a REIT. If Wynn Resorts sold its real estate in Las Vegas and Boston, it could easily generate over $5 billion in cash that could be used to pay down debt or fund future growth. Steve Wynn would never sell Wynn Resorts' real estate to a REIT, but under new CEO Matt Maddox, a sale may be on the table. When you consider the current operating value, potential growth, and the possibility Wynn Resorts will free up billions by selling real estate to a REIT, this is a gaming stock that's a great bet today.